The Department of Marine Science is the academic counterpart of the Marine Science Institute. 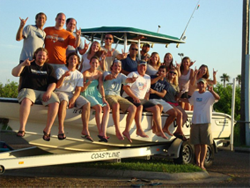 It offers a formal teaching program at the Institute in the summer, providing courses in marine science at the graduate and upper-division undergraduate courses levels. If you are a Junior, Senior, or New Graduate Student in Engineering and the Sciences, including Social Sciences, the Graduate School invites you to attend their NSF Workshop. For more information click here. The Department offers M.S. and Ph.D. degree programs in Marine Science. Students are expected to have completed the baccalaureate degree in one of the natural sciences. Graduate students normally spend an academic year on the Austin campus. Thereafter, they take specialized marine courses and conduct thesis and dissertation research at the Marine Science Institute. The College of Natural Sciences offers a B.S. degree in Marine and Freshwater Biology, which includes many courses offered by the Department of Marine Science. Students and research staff should conduct themselves under the ethical guidelines developed by our research staff.